Kick-off the new year with a study of the New Testament. The Church of Jesus Christ of Latter-Day Saints released an AMAZING manual, Come, Follow Me, that provides a guide through studying the New Testament. Make some goals for the new year... put studying the scriptures at the top of your priorities. I know your family will be blessed as you study the life of the Savior. 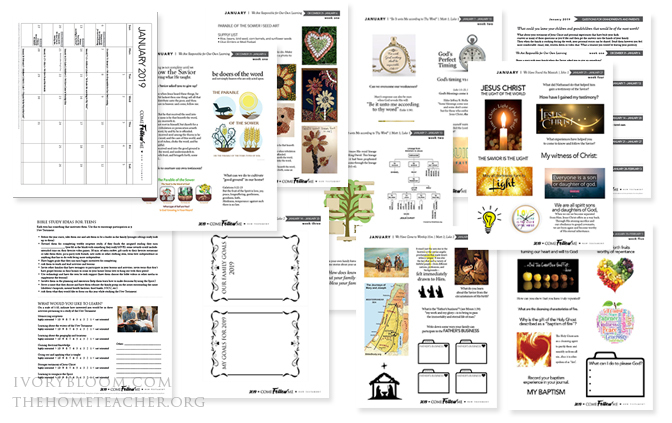 Keri at www.thehometeacher.com and I collaborated to create some exciting materials to help you teach your families this year. Here are some printables and ideas to help you and your family be successful! 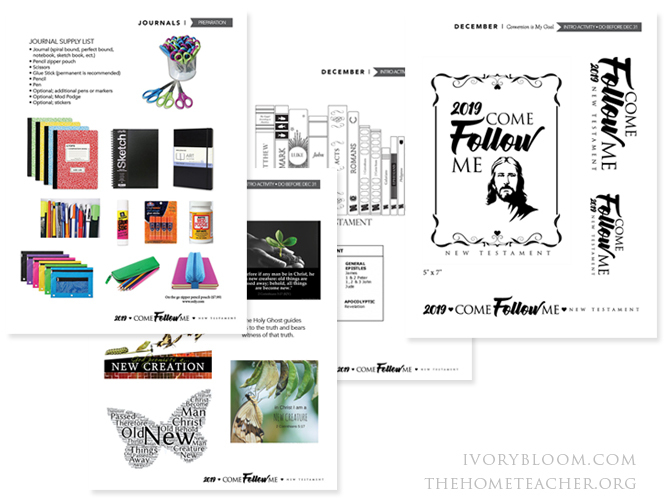 Download the January 2019 Come, Follow Me printables (includes calendar, bible journaling pages, questions for grandparents and ideas for teens). What could you leave your children and grandchildren that would be of the most worth? What about your testimony of Jesus Christ and personal experiences that have built your faith. Answer as many of these questions as you’d like and then get the answers into the hands of your family. Then when the family is studying during the week, your personal stories can be shared. Send them however you feel most comfortable: email, text, written down or video chat. What a treasure you would be leaving your posterity. Share a story with your family when the Savior asked you to give up something? What did you do to cultivate “good ground” in your home? Share some things your parents did to cultivate “good ground” in your home growing up. Share what you do to nurture your testimony? Share an experience where your testimony grew. Share an example from your life when you overcame a weakness. Share stories—from your own life—in which God did seemingly impossible things. God’s blessings come in His own time. Share a time when you had to wait for a blessing. What do you feel the Lord expects of you while you wait? Share some stories about ancestors who showed strength. How has knowing about your family history blessed your life? Ponder experiences when you have felt God’s guidance in protecting you and your family or loved ones. Share some of those experiences with your family. How do you participate in the Father’s Business? How have I gained my testimony? What experiences have helped you to come to know and follow the Savior? Write down and share your feelings about the Savior. Share some experiences about a missionary companion. Record your baptism experience share it with your family. When has your heart turned to God? 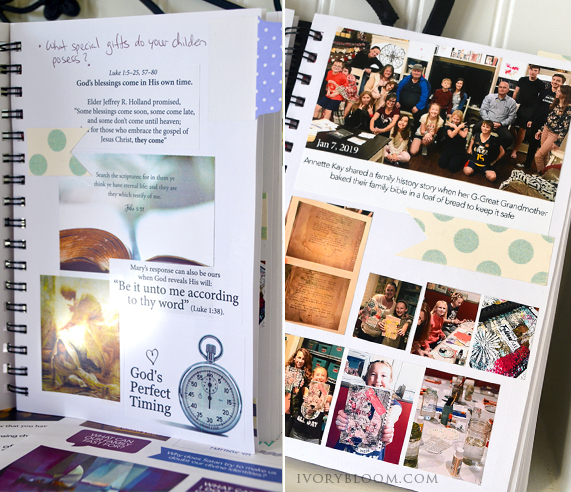 Need ideas to start your bible journal? Download this PDF for a supply list and printables. Scripture journal supply list and introduction journaling pages. 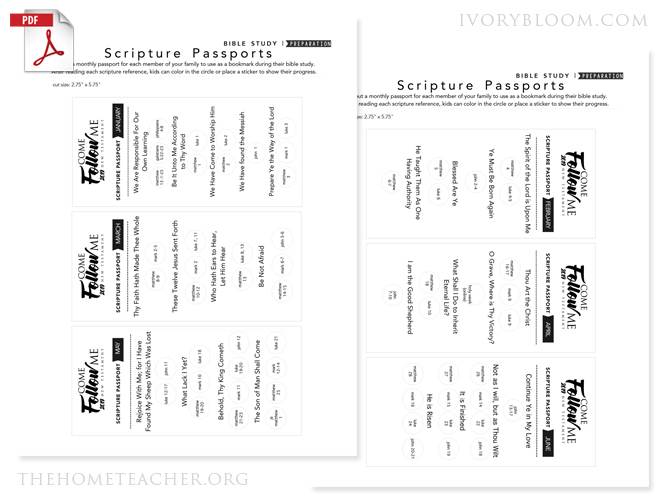 These bookmarks track the scriptures for each month. Jan - June 2019.